Designed for harsh environments - industrial and traction - the Rowe Hankins RCBO uses industry proven Sensata circuit breakers with an integrated current sensor. Rowe Hankins Residual Circuit Breaker Overloads are used to measure AC residual current and trip when a fault is detected. The RCBOs are available in 2 and 4 pole configurations - 2 pole series 373 and the 4 pole series 368. Both 2 and 4 pole versions are available at MCB ratings of up to 100 amps and different residual current trip levels. The circuit uses a current transformer to measure AC current imbalance. The signal is amplified, rectified and then passed to a time delay circuit. 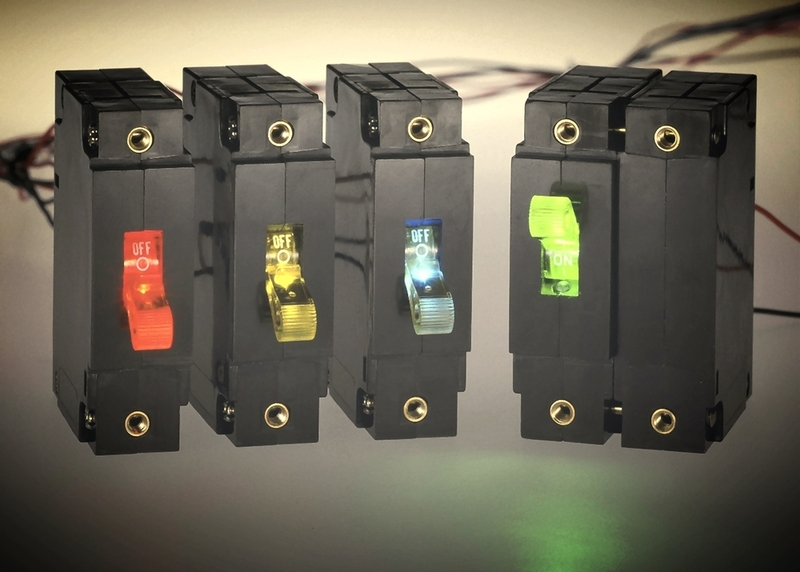 If the signal is present after the delay, then a solid state switch energises the supply circuit breaker trip coil. Options for either a fixed time delay or an inverse time delay trip characteristic can be specified. Trip currents can be specified for factory setting at levels between 5 and 300mA (Trips levels up to 2A are possible on a 4 pole series). A unit with a trip level of 5mA is specifically suited for the American market to meet the requirements of the ‘National Electrical Code NFPA 70’. A wide range of time delays can be specified and set during manufacture. The detector circuit power supply is derived from the AC supply. A test signal can be injected through the current transformer from a test button to confirm correct operation. • Our RCBO range uses AC residual current, the trip levels are typically between 30mA, 100mA and 300mA. • A range of various trip characteristics are available: instantaneous fixed time delay and inverse time delay. • Fitted with a ‘test button’ to check the circuit breakers trip setting when an appropriate residual current fault is generated internally. • Electrical connections to the unit are via M6 terminals, auxiliary contacts can be used to control and monitor the state of the circuit breaker. • Inverse time curve - the operating time of the RCBO is reduced as the residual current increases. • Fixed time delay - the units are tolerant of traction auxiliary supply functions.